A British-Canadian pro-wrestler has said he used his grappling skills to rescue a woman dangling from a bridge. Davey Boy Smith Jr, the son of famed wrestler, "The British Bulldog" Davey Boy Smith, posted on Facebook Sunday that he had just saved a woman's life. 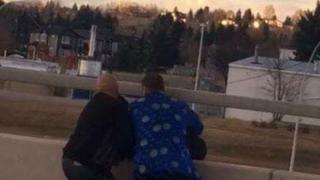 The woman had tried to jump off a bridge in Calgary, Alberta, but was hanging by her arms, he wrote. "Luckily ... I knew how to grab her HARD and how to pull her up from hanging off and jumping," he continued. "I really believe if I wasn't there and been able to grab her she would have jumped." Mr Smith Jr, who was born Harry Smith, said he was driving by the bridge when he noticed the woman hanging off of it and somebody trying to talk to her. "I stopped and jumped the barricade and tried talking to the girl. And she was crying and an emotional mess and threatening to jump if I got closer," he wrote. As she started to slip, Mr Smith Jr grabbed her and pulled her up, he said. Pictures he posted on Facebook of the incident show him and another large man holding onto someone over the edge of a bridge railing. "When I yanked her off the bridge finally, I established the mount position as you do in Grappling and did not let her budge," he wrote. Mr Smith Jr said she asked for a hug, but warned him that she had a gun. He said he held her down until police arrived on the scene, and the woman was taken into custody for her own safety. "Life is a precious thing folks. Never take it for granted. I'm glad I was at service to help somebody today and my years of grappling came into play."